Mt Manaia is one of a cluster of jagged, bush covered peaks towering 420m above sea level. 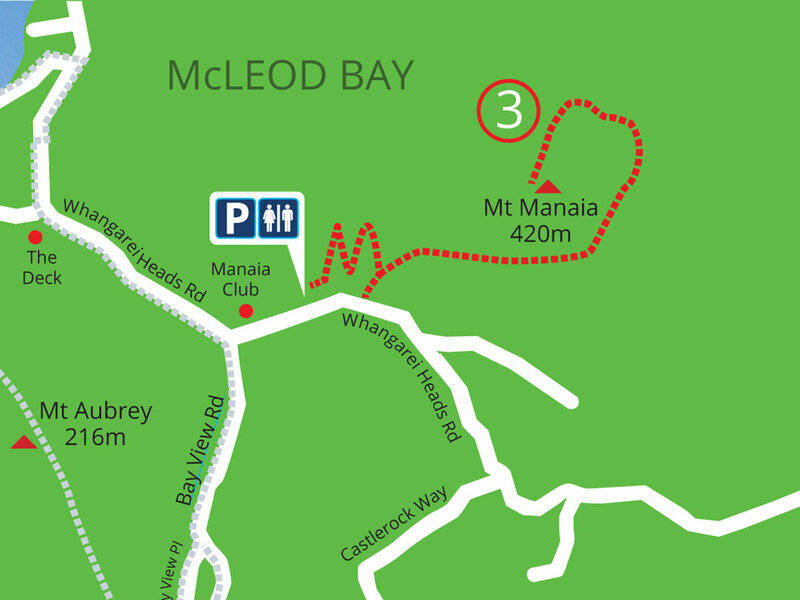 The Mt Manaia track begins with a lovely view south from the early settlers’ memorial and continues into the bush at an easy grade. Then the steps begin, which continue almost continuously to the top. Don’t miss the spur track on your right three quarters of the way up, where you will find a rock plateau with fantastic viewing – caution required. Near the top a wooden staircase leads to the highest accessible point. The views are two-fold: north-east over Whangarei Harbour towards the city, and a great view of Bream Head with the Hen and Chicken Islands behind. You must return the same way that you came.